221 Featherweight motor pulley. Fit all models, all metal. NOTE: Original plastic pulley for 221K .. Most common Kenmore zig-zag cam gear. 12/32" (9.5mm) shaft, vertical zig-zag cam. When replacing t..
Motor shaft hole is approximately 3/16". 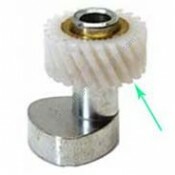 This pulley is for motors with a slight flat side on the m..
Alternate Part Numbers314011, 353207Fits the following Singer sewing machine models 1425, 4610, 59.. Fits ALL Singer 700 class Touch and Sew and 417. A better belt seat than original. Should be repla..
Singer 700 Touch and Sew series cam stack gear.Alternate Part Numbers381575, 381577Fits the followin..
Singer cam stack gear. PLEASE identify by picture (note some models use gear #444911).Please note: T..
Singer 600 Touch and Sew series cam stack gear.Fits the following Singer sewing machine models 620, ..
Singer cam stack gear for 240 series, 3100 series and other Fashionmate models made in Brazil and Eu.. 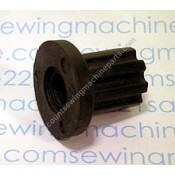 Compatible with top-long gear #174488.Fits the following Singer sewing machine models 4610, 4613, .. Fits ALL Alpha feed system. Compatible with #153487, #312902. SHOULD BE REPLACED IN SETS #174488 a.. Fits ALL Alpha feed system. Compatible with #153487, #312902. SHOULD BE REPLACED IN SETS #174488 an..
Top horizontal gear. Compatible with top vertical gear #155819. Special note: Replace this gear ONL..
Top vertical gear. Compatible with top horizontal gear #155818.Fits the following Singer sewing mac..
Horizontal gear compatible with gear #163328. Special note: Replace this gear only if defective, it..
Upper vertical gear with set screw. Fits 600 Touch and Sew series. This gear replaces some early 6..
Lower horizontal gear (right). Compatible with #174204Alternate Part Numbers163330Fits the followin..
Bottom vertical gear compatible with #163996.Alternate Part Numbers163327Fits the following Singer s..
Upper horizontal gear. Compatible with top vertical gear #445491-S. Special note: Replace this gea..
Singer 2010 hook gear. 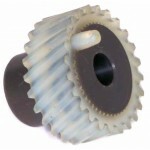 All nylon type gear, gear is secured bt fitting on square end of shaft. Com..
Singer Gear #422395 (Gear ONLY #39). Part #40, 41, 42 are NO LONGER AVAILABLE. All nylon type gear..
Top vertical gear. 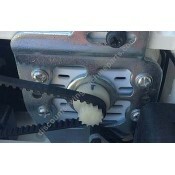 This gear has a set screw, not for models which use a pin (pin type gear no lon..
Hook gear. Compatible with gear #163997 Touch and Sew. Compatible gear for 2010 is #383961 found b..